A focus on mammalian OSVZ progenitors. † Master BioSciences, Département de Biologie, Ecole Normale Supérieure de Lyon. The outer subventricular zone (OSVZ) of the developing neocortex hosts a particular kind of progenitors resembling radial glia (RG), which have became a well-studied subject in the field because of their expected critical role in primate brain development and evolution. In this short review, we will recapitulate the main features of what is already known about other cell types populating the embryonic cortex, then review characteristics of the OSVZ, summarize the differences and similarities between RG and those progenitors (termed here OSVZ progenitors), and finally try to conclude on their “real” impact in evolution. What is the OSVZ ? What role in brain development ? What role in mammalian evolution ? Implications for medical researches ? Our understanding of the global developmental processes underlying mammalian brain formation has considerably increased in the past decades, and numerous highly conserved mechanisms were elucidated thanks to rodent models, however, it does not explain entirely how to build a thick and highly convoluted brain like ours. However, it is largely agreed that brain volume increase is probably the result of an increase in cell number, or more precisely of an increase in radial units  mediated by a higher number of neuronal progenitors. Studying this matter involves comparisons between various types of brain models. Mouse and rat are taken as the archetypes of lissencephalic rodents, and chimpanzee, macaque or humans as representatives of gyrencephalic primates. To have a more gradual view of increasing brain complexity, the ferret as a gyrencephalic carnivoran, the common marmoset as a near-lissencephalic primate, and sometimes agouti as a near gyrencephalic rodent are used to correlate some features to brain size or complexity. We will here recapitulate part of what is known on the different progenitor types found in the developing neocortex, from the NeuroEpithelial / Radial Glia (NE / RG) cells to Outer SubVentricular Zone (OSVZ) progenitors, which is our main focus. 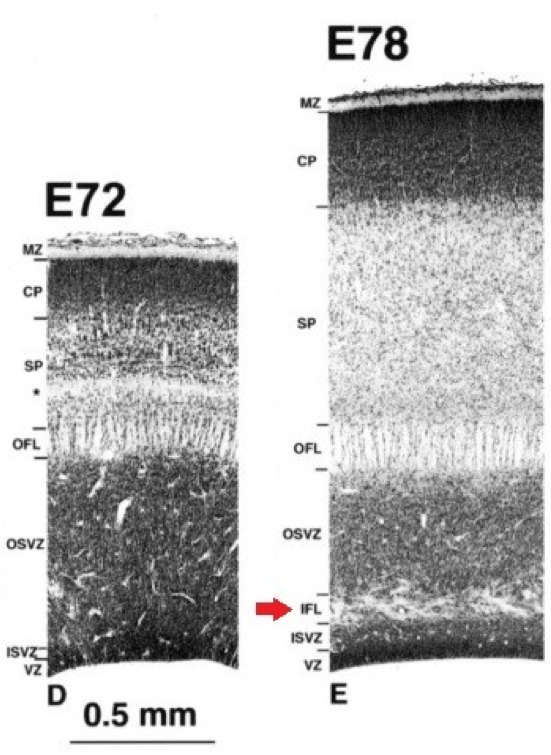 The OSVZ is -as its name states- the outer par of the subventricular zone, that was originally described while studying the boundary between cortical areas 17 and 18 in the cynomolgus monkey visual cortex [2,3]. Progenitors residing in this layer have been studied in different laboratories and therefore bear many names such as outer  / basal  / intermediate  or even translocating  radial glia, based on their resemblance with this cell type, plus OVZ progenitors  in mouse. We will here use the term “OSVZ progenitors” since it seems to be the most frequently used one, even though it may be improper considering that mice does not have a really divided SVZ, and that those cells are also present in the inner SVZ [6,8]. The increase in the SVZ size is the most remarkable feature of cortical evolution, therefore the discovery of OSVZ progenitors, that were first believed as maybe specific of primates , allowed to theorize that they could be somewhat responsible for the highly convoluted aspect of our brains. In the firsts steps of brain development, the neural tube is composed of a layer of cells in active proliferation named neuroepithelial cells. This results in a high density of cells in a restricted space, which is allowed by reducing the cytoplasm and stacking nuclei at different heights along the apical-basal axis of the epithelium, which is then described as “pseudostratified”. The cells also elongate and take the name of “radial glia”. The cell body of RG remains in the apical (ventricular) side, which will be called the ventricular zone(Figure 1A), the rest being filled with newborn neurons and/or other progenitors . A particular feature of NE and RG cells is interkinetic nuclear migration : the nucleus of those cells moves along the apical-basal axis during the cell cycle, and contacts the ventricular surface for the M-phase . Many explanations have been proposed for this behavior, but without getting into details, it may be related to the need for those cells to “fetch” their centrosome, since it is located at the apical surface, as a basal body which temporarily nucleates a primary cilium. At the onset of neurogenesis, RG starts producing either Intermediate Progenitors (IP, also called BP for “Basal Progenitors” or sometimes SVZ progenitors in rodents) or directly neurons, while being still able to proliferate [11-14] (Figure 1B). The long basal process of OSVZ progenitors has also been demonstrated to play a role in newborn cells migration : the daughter cell usually moves out of the VZ by “climbing” on the parental fiber. (A) Neuroepithelial cells elongate and become Radial Glia, (B) then either generates directly neurons or Intermediate progenitors that can self-amplify up to three times before terminal differentiation into neurons. (C) legend for schematics used in this review. In every illustration, the apical side (ventricular) will be represented down, and the basal side (pial surface) up. Generation of intermediate progenitors by RG cells is in fact much more frequent than directly neurons in the telencephalon , but it has been suggested that this could be the result of two distinct sub-populations of RG cells . Newborn IPs migrate to the SVZ where they usually divide in two neurons, but can sometimes self-amplify through up to three rounds of mitoses, thus increasing the neuronal output of RG cells and unveiling a possible role in the expansion of the cerebral cortex [11,15,17-19]. An interesting study on the appearance of neuronal markers in IP daughter cells suggests that pre-mitotic IPs might be already initiating differentiation , which feels contradictory with this (even limited) ability to proliferate. Another class of progenitors exists in the VZ which is called Short Neural Precursors (SNPs) in reference to their short basal process. Very little is known about this cell type, except that they seem to be exclusively neurogenic, and usually located at the ventricular surface. They were at first believed to be some kind of IP subclass [21,22], but this has been denied not so long ago . According to the authors, it would appear that neurons produced by this cell type populate significantly deeper regions than IPs, predominantly in layer IV. No hypotheses concerning their precise role has been formulated yet. The outer subventricular zone has been defined by the presence of an inner fiber layer (IFL) dividing the SVZ (Figure 2). The outer part was characterized as having a lower cell density as well as mitotic figures in it [2,3], but the fiber-based division is not always present or easily visible depending on studied species. With the increasing interest and knowledge on OSVZ progenitors, it became possible to give a more refined molecular definition to this zone. Figure 2. Division of the subventricular zone by the inner fiber layer (IFL) in the visual cortex of macaque embryos. Division of the subventricular zone by the inner fiber layer (IFL) in the visual cortex of macaque embryos. (Provided by Smart et al., 2002 ). A recent study on macaque, ferret and rat  characterized the Inner/Outer SVZ boundary in those three species using staining against Tau-1 for axonal fibers, Tbr2 for IPs and Pax6 for RG (and OSVZ progenitors [24,25]) as well as DAPI or Nissl to assess cell density. The IFL was seen only in the macaque occipital lobe, but wasn't apparent or had a different aspect in other cortical regions. In ferret and rat no clear IFL was present, however, the inner part of the OSVZ was often characterized by oblique or tangential streams of cells. This had been previously considered as a possible “vestigial” form of an IFL , but considered here by the authors as likely to be a simple migratory stream of newborn cells . Tau-1 staining in macaque resulted in a “striated” pattern in the OSVZ, and scarce labeling in the ISVZ and VZ. Observations on rat and ferret gave similar results. Tbr2 showed a dense staining band in the tau-free zone (supposedly the ISVZ) and a diffuse band in the tau- striated region (inner part of the OSVZ) in every species. Pax6 presented a strong labeling in the VZ. A diffused staining of Pax6 shows no sensible difference between inner and outer SVZ. Cell density, as assessed with DAPI or Nissl staining evidenced a high cell density in the VZ and in the ISVZ, but a lower density in the OSVZ in studied species. To solve the problem in species lacking an IFL, these results allows us to define the OSVZ as the low cell density, high Tau-1, and low Tbr2 region of the SVZ, as opposed to the high cell density, low Tau-1, and high Tbr2 ISVZ (Figure 3). Figure 3. 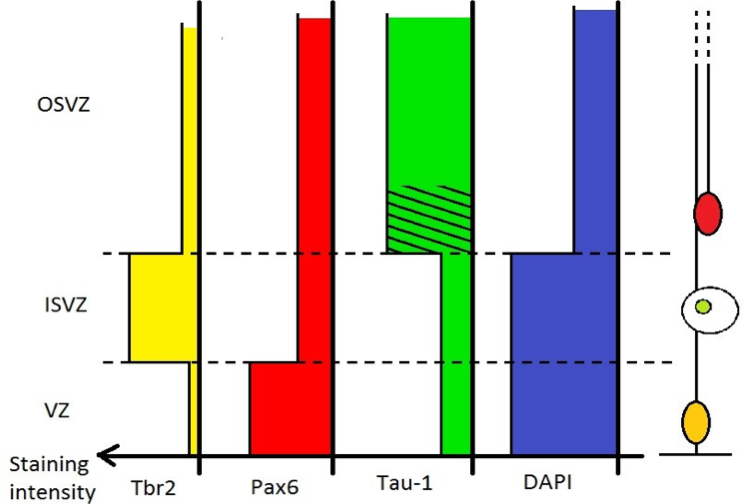 Differential staining intensity for Tbr2, Pax6, Tau-1 and DAPI along the apical-basal axis. Differential staining intensity for Tbr2, Pax6, Tau-1 and DAPI along the apical-basal axis. Tbr2 is characteristic of IPs, numerous in the ISVZ. Tau-1 stains axonal fibers present especially in the OSVZ, a striated pattern can be seen in the inner part of the OSVZ. DAPI stainings reveals a lower cell density in the OSVZ compared to the ISVZ and VZ. Pax6 stains both RG and OSVZ progenitors, but do not help defining the I/OSVZ boundary. Except in the very early stages of neurogenesis, RG cells divide in an asymmetric manner, but with a vertical cleavage plane (perpendicular to the ventricular surface), contradicting the expected model of asymmetric division : for cells showing only an apical-basal polarity axis, a vertical cleavage plane should be symmetric, and asymmetric divisions should theoretically involve an horizontal cleavage plane (parallel to the ventricular surface) . An asymmetric division means the two resulting daughter cells do not share equally constituents of the mother cell, or more generally (which is often the result) does not have the same fate. RG cells are characterized by their apical and basal processes, and their partition into daughter cells are thought to play important roles in the decision of daughter cell fate  (for more extensive explanations on progenitor cells polarity and mitotic spindle orientation, recent reviews are available [29,30]). The basal process can only be inherited by one daughter cell, while the apical domain is usually split. The daughter cell inheriting both apical and basal anchoring “remains” a radial glia cell, while the other daughter cell generally turns either into a neuron or IP, and can sometimes regrow a basal process to recover a RG identity depending on the embryonic stage and observed region. These asymmetric mitoses requires precise control of the mitotic spindle, which is the focus of numerous studies. Knocking in/out some spindle control related genes sometimes results in a randomization of mitosis cleavage plane, therefore unable to segregate correctly RG apical and basal processes. An unexpected consequence of these experiments was the presence in the upper brain layers of numerous, abnormally localized RG-like (or at least Pax6+) progenitors [27,31,32]. Such observations however rises interrogations concerning the true nature progenitors obtained this way : are they really proper OSVZ progenitors ? Would the apical and basal processes be the main cell fate determinants involved here ? Are they some kind of aberrant radial glia cells appearing upon unwanted “incorrect” divisions ? And would OSVZ progenitors be nothing but “floating” RG after an unusual oblique mitosis ? (up) Different modes of division for RG, the result of vertical cleavage plane is as previously described in figure 1. Oblique divisions generates OSVZ progenitors. (down) resulting aspect of the developing cortex. SNPs are not shown. Two important studies [33,34] have investigated the differences between human OSVZ progenitors and RG to answer that last question. Taken together, these articles cover a wide range of cell characteristics, from well-known proliferation markers to an unexpected electrophysiological study (Table 1). Table 1. Comparison between radial glia and OSVZ progenitor. Most features tend to show that OSVZ progenitors are delaminated radial glia. Comparison between radial glia and OSVZ progenitor. Most features tend to show that OSVZ progenitors are delaminated radial glia. Retain basal process during M-phase ? Non-progenitor daughter cell may regrow basal process ? In many aspects, OSVZ progenitor and RG were shown similar : cells were most -if not all- of the time positive for Nestin, BLBP, GLAST and GFAP which is characteristic from RG. Both cells types are also positive for Pax6, Sox2, Ki67 and phospho-vimentin, classically used to identify proliferating cells. Electric resistance of OSVZ progenitors and RG was also comparable (while being different from other cell types found in the OSVZ). Neuronal markers like DCX and βIII-tubulin were never found neither in RG nor in OSVZ progenitors, as well as Tbr2, typically expressed in IP cells. On a behavioral aspect, they retains their basal process during M- phase, and the non-progenitor daughter cell is sometimes able to regrow a basal process to become a progenitor itself, like RG. The study characterizing the OSVZ in macaque, ferret and rat also claims that different sub-populations of OSVZ progenitors can be identified based on Olig2 expression  (directs astrocyte formation), echoing possible sub-populations among radial glia cells . It is however credible in both cases that they may in fact be different behavioral stages of the same cell type. But some differences had also been found : even if this can seem obvious considering their morphology, OSVZ progenitors no longer express apical domain markers such as Par3, ZO-1 and Prominin-1 present in RG. When dividing, as opposed to RG, they tend to show a more randomized mitotic spindle with a reported preference for horizontal cleavage plane, which makes sense with having only one process to segregate. Those two cell types diverge also on their dependency over integrin signaling at the pial (basal) surface : OSVZ progenitors population rapidly decreased upon integrin disruption, while RG proliferation was relatively unaffected . It was however proposed that RG can obtain trophic signals through their apical domain, lowering the effect of basal disruption of integrins . Finally, electrophysiology analyzes revealed “small, brief, inward, tetrodotoxin sensitive currents” in OSVZ progenitors, not shared by RG . 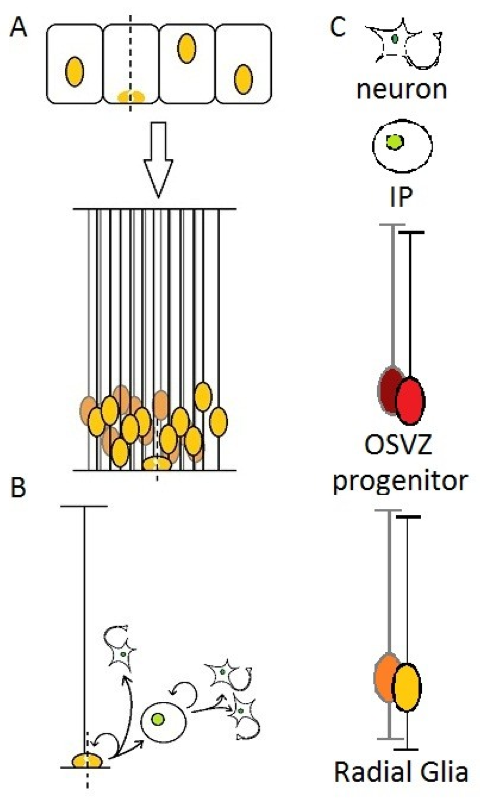 Complementaryanalyses using micro-dissections (ISVZ + VZ was removed) in these studies showed that OSVZ progenitors generate directly or indirectly, both exitatory and GABA inhibitory neurons (assessed by βIII-tubulin and ASCL-1 respectively), but their progeny often seems to proliferate without differentiating or recovering their characteristic RG-like morphology. Some intermediate progenitors (Tbr2 positive cells) originating from the OSVZ have also been reported. Considering these results, both differences and similarities between those two cell types progenitors suggests, as proposed by the authors, that OSVZ progenitors can be regarded as delaminated RG cells. Studies on other species [4,8] have comforted -if not demonstrated- using time-lapse video microscopy the hypothesis that OSVZ progenitors arise from oblique divisions, and have also contributed to characterize OSVZ progenitors, for example, it has been demonstrated that these cells undergo before mitosis what is called “Mitotic Stromal Translocation” (MST), which reminds the Interkinetic Nuclear Migration RG cells undergo, while it is possible this behavior could be a vestigial one-way form of it : the cell body moves toward the basal side, without performing the opposite movement after, which would be difficult due to the absence of an apical anchoring. The role of the Notch pathway has also been shown to regulate their differentiation  as well as the ability for cells to regrow a basal process . OSVZ progenitors have a still unclear role in brain development, it seems obvious that more progenitors means more neurons, which is a necessary step to increase brain size. The basal process of OSVZ progenitors was viewed as a “scaffold” promoting lateral expension , or as a way to increase the number of neurogenic columns  which, in the end, converges to Rakic's radial unit hypothesis , implying that more neurogenic columns would lead to cortical lateral expansion, and in the case of OSVZ progenitors, the lack of apical anchoring could allow an uncoupling of the basal and apical surfaces, which in the end should lead to gyrencephaly. Even thought some experiments presented above resulted in “extra” OSVZ progenitors to appear, it didn't show a clear relation with brain size. For example mouse Inscutable knock-in randomized cleavage plane and increased brain size, while showing an abnormally high number of Pax6+ cells  (being probably OSVZ progenitors) outside of the VZ. However, Huntingtin knock-out also disturbed mitotic spindle control, but premature differentiation of progenitors was observed instead of any OSVZ progenitors-like cells . In the end, these might well be side effects, since some genetic alterations like LGN knock-out also randomized the cleavage plane without any brain size change being reported [8,27]. Characterization of the OSVZ in human brain and the discovery of the progenitors it contains led to new hopes for our understanding mammalian brain evolution and development, and maybe finding the key feature underlying human higher intelligence (see for example ). However, it has been evidenced later that this cell type was not restricted to primates, but most probably a characteristic of gyrencephalic brains, since OSVZ progenitors have been identified in ferret [26,33]. This prompted researchers to investigate whether this cell type also exists in species with a “simpler” brain, but OSVZ progenitors were again found in the common marmoset (near lissencephalic primate) as well as in agouti (near gyrencephalic rodent) with cell density comparable to ferret or human brain at studied stages [5,37]. It has been proposed that the marmoset lissencephaly evolved from a gyrencephalic primate ancestor , but it may not solve the problem considering that even mouse (lissencephalic) presented OSVZ progenitors [4,8]. Nevertheless, these findings does not exclude a possible differential regulation of these cells , and the low number of OSVZ progenitors in mouse [4,8] compared to other studied species correlates with the increase in OSVZ size in most gyrencephalic animals . It was also proposed recently that these progenitors could be a way to develop a larger brain faster  instead of increasing size or complexity. Disruption of mechanisms involved in brain development often results in mental retardation syndromes, for example genes involved in microcephaly have been studied and ended up being - at least for part of them - linked to mitotic spindle control in neuronal precursors . Other mental diseases are expected or known to have genetic bases, like schizophrenia, autism, and epilepsy . While researches presented here will probably not provide a cure for the most severe of these disorders, we can hope to learn crucial information to improve the treatment of apparently unrelated conditions like Alzheimer's disease (or neurodegenerative ones in general). Leads explored for treatments usually involve grafts of neuronal tissue or “reactivation” of “dormant” progenitors, and therefore the demonstration that Pax6+ OSVZ progenitors are still present after neurogenesis  enlightens new paths to explore for future medical researches. Our understanding of the exact role of OSVZ progenitors in brain development and evolution is still limited, but at a first glance, and considering their presence in every studied species, it would seem that their role may not be as crucial as we thought. However, the precise behavior of those cells, and especially their progeny can still show critical differences among species. For example, it could be interesting to investigate whether neurons generated by OSVZ progenitors populate preferentially one cortical layer, like SNP progeny seems to. The relationship between OSVZ progenitors and RG can still undergo further investigations : the endogenous mechanism responsible for shifting an usually vertical cleavage plane to oblique is not known, and understanding this could allow designing experiments where OSVZ progenitors would be forced to remain radial glia cell, which could reveal specificities without affecting the neuronal output. 1.Rakic P. Evolution of the neocortex: a perspective from developmental biology. Nature reviews. Neuroscience 10 , 724-35 (2009). 2.Smart IHM, Dehay C, Giroud P, Berland M, Kennedy H. Unique morphological features of the proliferative zones and postmitotic compartments of the neural epithelium giving rise to striate and extrastriate cortex in the monkey. Cerebral cortex (New York, N.Y. : 1991) 2002, 12: 37-53 (). 3.Lukaszewicz A et al. G1 phase regulation, area-specific cell cycle control, and cytoarchitectonics in the primate cortex. Neuron 2005, 47: 353-64. 4.Wang X, Tsai J, LaMonica B. A new subtype of progenitor cell in the mouse embryonic neocortex. Nature neuroscience 2011, 14: 555-561. ● This article presents a detailed observation of the mitotic stromal translocation, and along with ref.8, demonstrates the existence of OSVZ progenitors in mouse and their oblique-mitosis origin. 5.Kelava I et al. Abundant Occurrence of Basal Radial Glia in the Subventricular Zone of Embryonic Neocortex of a Lissencephalic Primate, the Common Marmoset Callithrix jacchus . Cerebral cortex (New York, N.Y. : 1991) 2011, 2: 469-481. ● Analyzes showed in this article demonstrates that OSVZ progenitors exists with comparable density in lowly-convoluted brains. 6.Reillo I, de Juan Romero C, García-Cabezas MÁ, Borrell V. A role for intermediate radial glia in the tangential expansion of the mammalian cerebral cortex. Cerebral cortex (New York, N.Y. : 1991) 2011, 21: 1674-94. 7.Martínez-Cerdeño V et al. Comparative Analysis of the Subventricular Zone in Rat, Ferret and Macaque: Evidence for an Outer Subventricular Zone in Rodents. PloS one 2012, 7: e30178. ● This article is the main source of information for a molecular rather than cytoarchitectonic definition of the OSVZ. 8.Shitamukai A, Konno D, Matsuzaki F. Oblique radial glial divisions in the developing mouse neocortex induce self-renewing progenitors outside the germinal zone that resemble primate outer subventricular zone progenitors. The Journal of neuroscience : the official journal of the Society for Neuroscience 2011, 31: 3683-95. ● This study shows that notch constitutive activation allows some progenitors to regrow a basal process, and along with ref.4, demonstrates the existence of OSVZ progenitors in mouse and their oblique-mitosis origin. 9.Götz M, Huttner WB. The cell biology of neurogenesis. Nature reviews. Molecular cell biology 2005, 6: 777-88. 10.Taverna E, Huttner W.B. Neural Progenitor Nuclei IN Motion. Review for Interkinetik nuclear migration 2010. 11.Pontious A, Kowalczyk T, Englund C, Hevner RF. Role of intermediate progenitor cells in cerebral cortex development. Developmental neuroscience 2008, 30: 24-32. ● Review for intermediate progenitors. 12.Noctor SC, Flint C, Weissman T, Dammerman RS, Kriegstein R. Neurons derived from radial glial cells establish radial units in neocortex. Nature 2001, 409: 714-20. 13.Miyata T, Kawaguchi A, Okano, Ogawa M. Asymmetric inheritance of radial glial fibers by cortical neurons. Neuron 2001, 31: 727-41. 14.Malatesta P, Hartfuss E, Götz M. Isolation of radial glial cells by fluorescent-activated cell sorting reveals a neuronal lineage. Development (Cambridge, England) 2000, 127: 5253-63. 15.Miyata T et al. Asymmetric production of surface-dividing and non-surface-dividing cortical progenitor cells. Development (Cambridge, England) 2004, 131: 3133-45. 16.Pinto L et al. Prospective isolation of functionally distinct radial glial subtypes--lineage and transcriptome analysis. Molecular and cellular neurosciences 2008, 38: 15-42. 17.Haubensak, W., Attardo, A., Denk, W. & Huttner, W.B. Neurons arise in the basal neuroepithelium of the early mammalian telencephalon: a major site of neurogenesis. Proceedings of the National Academy of Sciences of the United States of America 2004, 101 , 3196-201. 18.Noctor SC, Martínez-Cerdeño V, Ivic L, Kriegstein AR. Cortical neurons arise in symmetric and asymmetric division zones and migrate through specific phases. Nature neuroscience 2004, 7: 136-44. 19.Martínez-Cerdeño V, Noctor SC, Kriegstein AR. The role of intermediate progenitor cells in the evolutionary expansion of the cerebral cortex. Cerebral cortex (New York, N.Y. : 1991) 2006, 16 Suppl 1: i152-61. 20.Attardo A, Calegari F, Haubensak W, Wilsch-Bräuninger M, Huttner WB. Live imaging at the onset of cortical neurogenesis reveals differential appearance of the neuronal phenotype in apical versus basal progenitor progeny. PloS one 2008, 3: e2388. 21.Gal JS et al. Molecular and morphological heterogeneity of neural precursors in the mouse neocortical proliferative zones. The Journal of neuroscience : the official journal of the Society for Neuroscience 2006, 26: 1045-56. ● This article constitute the original description of short neural precursors, and concludes it might be a subclass of intermediate progenitor. 22.Kowalczyk T et al. Intermediate neuronal progenitors (basal progenitors) produce pyramidal-projection neurons for all layers of cerebral cortex. Cerebral cortex (New York, N.Y. : 1991) 2009, 19: 2439-50. 23.Stancik EK, Navarro-Quiroga I, Sellke R, Haydar TF. Heterogeneity in ventricular zone neural precursors contributes to neuronal fate diversity in the postnatal neocortex. The Journal of neuroscience : the official journal of the Society for Neuroscience 2010, 30: 7028-36. ● This article completes the study of SNPs from ref.21 and concludes that they are not a subclass of IPs. 24.Mo Z, Zecevic N. Is Pax6 critical for neurogenesis in the human fetal brain? Cerebral cortex (New York, N.Y. : 1991) 2008, 18: 1455-65. 25.Bayatti N et al. A molecular neuroanatomical study of the developing human neocortex from 8 to 17 postconceptional weeks revealing the early differentiation of the subplate and subventricular zone. Cerebral cortex (New York, N.Y. : 1991) 2008, 18: 1536-48. 27.Konno D et al. Neuroepithelial progenitors undergo LGN-dependent planar divisions to maintain self- renewability during mammalian neurogenesis. Nature cell biology 2008, 10: 93-101. ● This article studies the effect of LGN-ko on spindle orientation, these mice will also be used to study OSVZ progenitors in ref.8. 28.Marthiens V, French-Constant C. Adherens junction domains are split by asymmetric division of embryonic neural stem cells. EMBO reports 2009, 10: 515-20. 29.Fietz, SA, Huttner, W.B. Cortical progenitor expansion, self-renewal and neurogenesis-a polarized perspective. Current opinion in neurobiology 2011, 21 :23-35. ● Review for more information on mitotic spindle control. 30.Morin X, Bellaïche Y. Mitotic Spindle Orientation in Asymmetric and Symmetric Cell Divisions during Animal Development. Developmental cell 2011, 21: 102-19. 31.Asami M et al. The role of Pax6 in regulating the orientation and mode of cell division of progenitors in the mouse cerebral cortex. Development (Cambridge, England) 2011, 21 : 5067-5078. 32.Postiglione MP et al. Mouse Inscuteable Induces Apical-Basal Spindle Orientation to Facilitate Intermediate Progenitor Generation in the Developing Neocortex. Neuron 2011, 72: 269-284. ● This article studies a gene involved in spindle control, very characteristic groups of Pax6+ cells in the OSVZ appear upon spindle randomization. 33.Fietz SA et al. OSVZ progenitors of human and ferret neocortex are epithelial-like and expand by integrin signaling. Nature neuroscience 2010, 13: 690-9. ● Along with ref.34, thee articles constitute a precise and valuable characterization of OSVZ progenitors, this one presents in particular a study of integrin signaling. 34.Hansen DV, Lui JH, Parker PRL, Kriegstein AR. Neurogenic radial glia in the outer subventricular zone of human neocortex. Nature 2010, 464: 554-561. ● Along with ref.33, thee articles constitute a precise and valuable characterization of OSVZ progenitors, this one adding in particular a study of notch signaling. 35.Haubst N, Georges-Labouesse E, De Arcangelis A, Mayer U, Götz M. Basement membrane attachment is dispensable for radial glial cell fate and for proliferation, but affects positioning of neuronal subtypes. Development (Cambridge, England) 2006, 133: 3245-54. 36.Godin JD et al. Huntingtin is required for mitotic spindle orientation and mammalian neurogenesis. Neuron 2010, 67: 392-406. 37.García-Moreno F, Vasistha N, Trevia N, Bourne J, Molnár Z. Compartmentalization of cerebral cortical germinal zones in a lissencephalic primate and gyrencephalic rodent. Cerebral cortex (New York, N.Y. : 1991) 2012, 22: 482-92. ● This article completes ref.5 to demonstrate that OSVZ progenitors are not specific of gyrencephalic species.